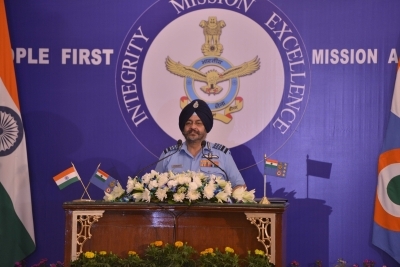 New Delhi, Oct 5 (IANS) The Indian Air Force is ready to fight a two-front war and has adequate capability to take on any military challenge from China, Air Chief Marshal B.S. Dhanoa said on Thursday. 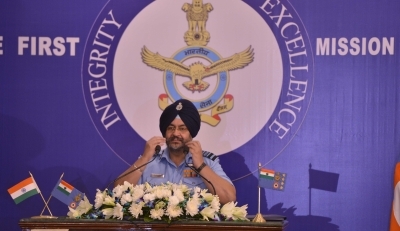 Addressing the annual IAF press conference ahead of Air Force Day on October 8, Dhanoa said in a single front scenario, whether it is Pakistan or China, the IAF was adequately capable of tackling any threat from the neighbours. Dhanoa said though the Air Force did not have the sanctioned full squadron strength of 39 but it still had a Plan B in case a war breaks out simultaneously from the eastern (China) and western (Pakistan) borders. “We need a strength of 42 squadrons to carry out full spectrum operations in a two-front (war) scenario. It doesn’t mean we are not capable of fighting a two-front war. We have a Plan B. “To cater for the strength there are ways and means by which you can generate more sorties, you can carry out 24-hour operations, whatever we can do at our level, increase the serviceability of our aircraft, we are doing so that we are able to carry out the task mandated by our government,” he said. Dhanoa, who as the Vice Chief of the IAF had said the number of fighter aircraft squadrons in India was not enough to fight a war on two fronts, maintained on Thursday that the remark to a Parliamentary Standing Committee was in reference to “full spectrum operations”. The IAF currently has 33 combat squadrons against a sanctioned strength of 39.5, which is sought to be raised to 42. Dhanoa’s predecessor Arup Raha, days before his retirement, had said the IAF needed at least 200 more fighter jets in the next 10 years. Dhanoa said the IAF had a plan to address the shortage of fighter squadrons and by 2032, the force would have its full squadron strength. He said “politically, till date we have not been part of a two front war”. Asked about his earlier comments on the squadron strength not being enough, he said the remarks were about full spectrum operations for which the IAF needed 42 squadrons. About China alone he said it was not about what assets they have but about what they can deploy in Tibet which is a plateau with an average elevation of 4,500 metres. “If you take China, it is not what China has got, it is what China can project against us. To project against us is what they can get into Tibet. Look at Google Earth and see what they can or cannot do from Tibet. That will give you an answer what is our capability. Our capability is adequate,” he said. Referring to the Doklam military standoff, the IAF chief said Chinese forces were still present in Tibet’s Chumbi Valley which lies close to the disputed tri-junction. “The two sides are not in a physical face off as we speak, in face to face contact. However, the (Chinese) forces in Chumbi valley are still deployed,” Dhanoa said. The Chumbi Valley is north of Doklam, where Indian and Chinese troops were locked in a long standoff after India objected to China building a road in the uninhabited tri-junction claimed by Bhutan and China. Asked about the two and a half-front war – in which the half-front is in reference to internal security threats, Dhanoa said while the force was involved in anti-Maoist operations in support roles, it would not use fire power on its own citizens. “The half-front that you are referring to is internal security. We are actively engaged in operations of providing recce and transport support. As a democracy, we don’t use kinetic air power against our own people,” he said.